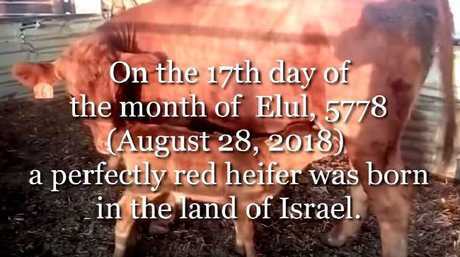 A BIBLE prophecy predicting the End of Days is feared to come true after the first 'red heifer in 2,000 years' was born in Israel. 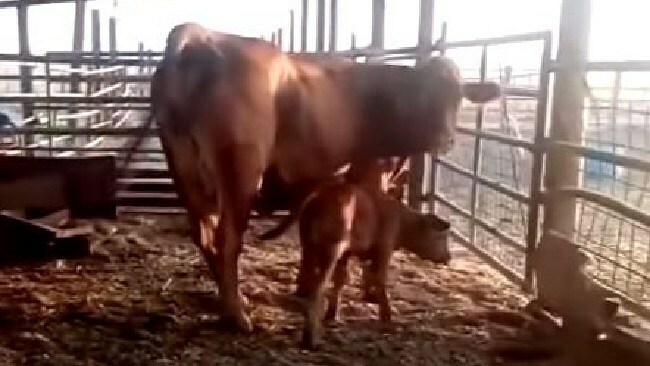 The Temple Institute in Jerusalem announced the calf's birth on YouTube, saying it would undergo "extensive examination" to determine if it is red all over. According to The Sun, if the female baby cow is found to be "blemish free", the Institute will declare that the calf "brings the promise of reinstating Biblical purity to the world". In both Christianity and Judaism, the red heifer is central to the prediction about the "end of times". After sacrificing the red cow, construction can begin on the Third Temple in Jerusalem. The Temple Institute and other groups worldwide were set up with the goal of building the Third Temple on Mount Moriah, or on the Temple Mount. The red heifer (also known as the red cow) was a cow brought to priests for sacrifice in the Hebrew Bible. Jewish and Christian fundamentalists believe that once a red heifer is born they will be able to rebuild the Third Temple on the Temple Mount in Jerusalem. But in order to do this, they would have to demolish what stands on the hill today - the Dome of the Rock, an Islamic holy temple. In mainstream Orthodox Judaism, once the Temple is rebuilt the world will welcome the coming of the Jewish Messiah. Humanity will then face the Last Judgment. But some theologians say the building of the Third Temple is linked to 'Judgement Day' or the "end of times". This apocalyptic event will bring what Christians call "the rapture" - where all Christian believers (living and dead) will rise into the sky and join Christ. The fate of nonbelievers isn't quite so promising. For them the rapture means everlasting punishment of their souls in hell. Rabbi Chain Richman, director of the Institute, believes the time is ripe to build the Third Temple, following the birth of the red heifer.